On 10/24/15 at about 6:45 AM, deputies were called to a residence in the 900 block of Brockway Avenue in South Lake Tahoe regarding an assault that just occurred. At the residence, deputies found an adult male with multiple cuts on both arms that were bleeding. The male told deputies he woke when someone was pounding on his front door. Opening it, a female he knew had a machete, she demanded money, and charged him. During the altercation, he was injured fighting over the machete. The victim was able to get away and close the door. The female was identified as South Lake Tahoe resident, 51 year-old Deborah Darr. Deputies tracked the female to an address on Tata Lane in South Lake Tahoe where she was located and detained. She too had injuries as a result of the fight. Sheriff’s deputies took Darr into custody and the machete was recovered as evidence. 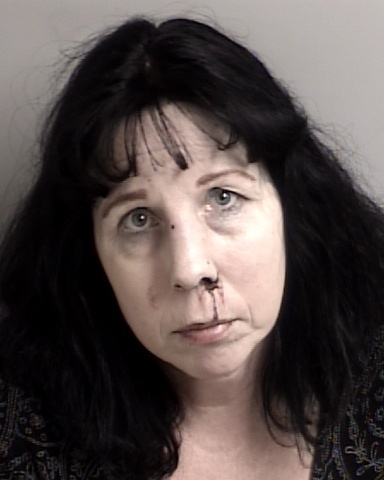 At about 8:00 AM, Deborah Darr was booked into the El Dorado County Jail in South Lake Tahoe of assault with a deadly weapon charges. She was released on a $25,000 bond.